Steven Holl has created a body of work as formally and as tectonically inventive as that of any architect working today. His most successful structure may be the 2007 addition to the Nelson-Atkins Museum of Art in Kansas City, Missouri — known as the Bloch Building — which consists of a series of subterranean galleries that emerge on to a sculpture park as glowing apparitions. Because the galleries, and the infrastructure that supports them, are largely underground, the ‘lanterns’ were able to make the journey from Holl’s sketchpads to real life without losing their purity of form. His least successful building may be Simmons Hall, a dormitory at the Massachusetts Institute of Technology (2002), essentially a vast rectangle of relentless concrete grids interrupted by occasional shafts that resemble the insides of volcanoes. There, formal preoccupations fight with practical considerations; for example, getting air in some rooms requires opening nine tiny windows. The result is a clash between aesthetics and everyday life. 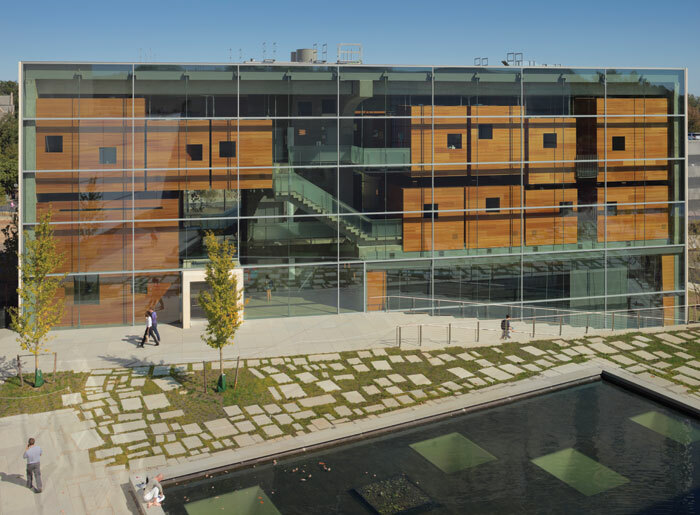 The Lewis Center, a 14,000 sq m arts complex for Princeton University, bears elements of both the Bloch Building and Simmons Hall. Like Bloch, it has significant underground elements, allowing it to emerge from the ground as a series of luminous structures. Like Simmons, it is large and programladen, meaning practical considerations sometimes compete against architectural experimentation. ‘Why is my classroom three storeys high, but with no windows, no storage, and no soundproofing?’ emailed a friend who teaches at Princeton when he heard I was writing about the building. The answer is that Holl designs ethereal forms — he renders not in pen or pencil but in watercolour — and sometimes struggles to make spaces fit inside them comfortably. But the three-storey-high studio, while not conventional, is also challenging, in the best sense of the word. 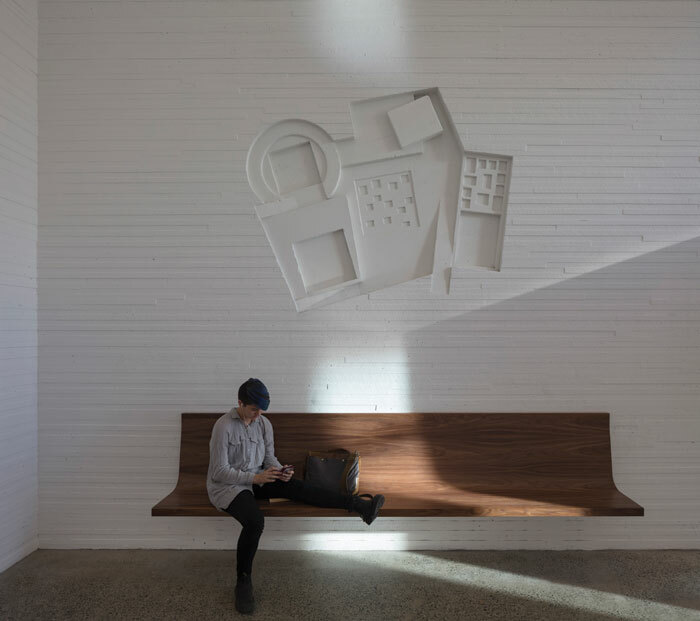 In a centre for the arts, unusual and even peculiar spaces can be catalysts for creativity. It’s a truism that great architecture requires constraints; great architecture may also impose them. In fact, Princeton’s most beloved buildings, its collegiate gothic dormitories, are popular largely because they require students to adapt to fanciful design decisions; the desire to vary their exterior appearance, with narrow and wide bays and other manipulations of volume, make some rooms too large, others too small (I experienced both as an undergraduate), and very few just right. Holl (working with Noah Yaffe as partner-incharge) was a good choice for a campus loved for eschewing architectural homogenisation. A bit of background: until quite recently, Princeton treated music, dance and theatre largely as extracurricular pursuits, and the campus reflected that: the university’s biggest auditorium was one built by a student organisation before the Second World War. But over the past three decades Princeton has upped its commitment to performance within the academy. As the university’s president announced in 2006: ‘The time has come for Princeton to give greater recognition to the centrality of the arts in its teaching and research mission.’ It needed facilities to match its promises. A donor (the late insurance magnate Peter Lewis) was located, as was a site (home to a train station near the southern end of campus). Readying the site, 9ha in all, involved moving not only the train station (and tracks) but also several city streets and a popular convenience store. (The replacement train station and store were designed with great panache by the Arizona architect Rick Joy.) If the process, requiring municipal consent, was tortuous (at one point Holl was told to redesign the complex for another site entirely), the program for the Lewis Center was relatively straightforward: a series of performance venues for dance, music and theatre, plus related classrooms and administrative spaces. 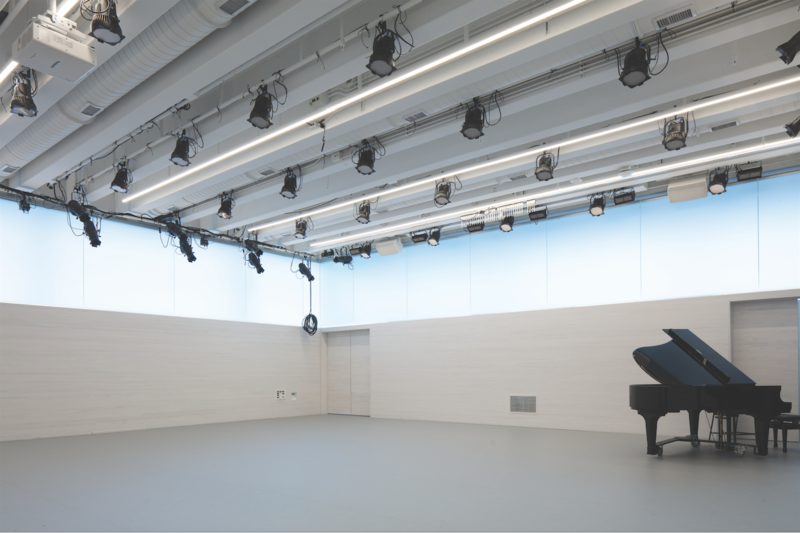 The university was prepared to build the best of the best, including dance studios with sprung (shock-absorbing) floors, music rehearsal rooms with almost complete acoustic isolation, and numerous high-tech performance spaces, including one with a ceiling low enough for students to learn about theatrical lighting without having to climb ladders. But what form would the complex take? Princeton University’s central campus consists of the Georgian-Colonialstyle Nassau Hall (1756); a pair of ‘Greek temples’ built in 1893 for rival debating societies; a few Romanesque-revival piles; and then, forming the bulk of the campus, the collegiate gothic dormitories, mostly built between the 1890s and the 1930s. It’s those dorms, evoking Oxford and Cambridge, which most people think of when they think of Princeton. Since 1960 the university has experimented with a variety of successors to collegiate gothic, which the powers that be considered unbecoming to a modern institution and/or too expensive to build properly. One of the best postwar buildings is IM Pei’s Spelman Halls (1973), a precast concrete dormitory composed of four-storey pavilions that open on to a constricted pathway. There are also several academic buildings with patterned-brick facades (making them nominally postmodern) by Venturi Scott Brown; a crinkled science library by Frank Gehry; and laboratories by the likes of Rafael Viñoly. In the early 2000s, the university — largely at the behest of donors nostalgic for the ‘real’ Princeton — built a new residential college designed by Demetri Porphyrios to mimic the beloved collegiate gothic buildings. But though he was working with the same materials and ostensibly seeking the same result as his predecessors, Porphyrios was required to accommodate hallways lined with rows of nearly identical dorm rooms; that precluded the varied, almost syncopated massing that makes the earlier collegiate gothic buildings special. Ironically, it is Holl, whose detailing couldn’t be any more modern, who has captured the almost improvisational quality of Princeton’s ‘This Side of Paradise’ campus. Holl won the competition to design the $300m Lewis Center by proposing to erect not one large building (as Renzo Piano reportedly did) but three smallish structures, facing — that is, forming — a courtyard. For a time, he wrestled with what shapes the three buildings would take, eventually settling on a large rectangular solid for music; a cylinder grafted on to a trapezoidal structure for theatre and dance; and a nearly square tower (16m x 13m, but set into a wider base) for classrooms and offices. The massing is meant to mimic the organisation of the collegiate gothic dorms. One shortcoming to Holl’s composition is that, because the three buildings are relatively far apart, it fails to replicate the excitement of moving through narrow gothic archways into spacious courtyards, a kind of compression and release. Holl has said that the openings had to be wide because the Lewis Center forms a new gateway to the campus. But it is a somewhat awkward gateway: from the train station, the choices are to enter the complex through a conventional ‘storefront’ facade, climb a stepped ramp to the raised courtyard, or walk around the complex altogether. Holl, meanwhile, has described the arrangement of the buildings as inspired in part by Malevich’s experiments in suprematism, in which pure forms collide at acute angles (indeed, the music and theatre buildings are just over 16 degrees from parallel). He has also pointed out that the dimensions of his new courtyard are almost exactly those of the Campidoglio in Rome. But, wisely, he claims neither as direct precedent: at the Campidoglio, symmetry is key; the courtyard is entered on axis. At the other extreme, suprematist geometry is far more dynamic that Holl’s tidy arrangement. But let’s cut Holl some slack. His courtyard (landscaped by Michael Van Valkenburgh Associates) is also a roof, taking the opportunity, unavailable to the architects of the collegiate gothic buildings, to put large rooms underground. Also underground are 140 geothermal wells, each 128m deep, providing most of the heating and cooling for the complex. Directly below the courtyard, Holl inserted a 743 sq m gathering space, turning the void between the three visible buildings into, effectively, a fourth building. Skylights — glass openings in the courtyard’s 21m x 21m reflecting pool — bring beautiful dappled light into the space, which also offers peeks into the four performance venues and an art gallery. Called the Forum, it is likely to become one of the most popular gathering places on campus. At the north side of the courtyard is the music building, the most successful of the above-ground structures. 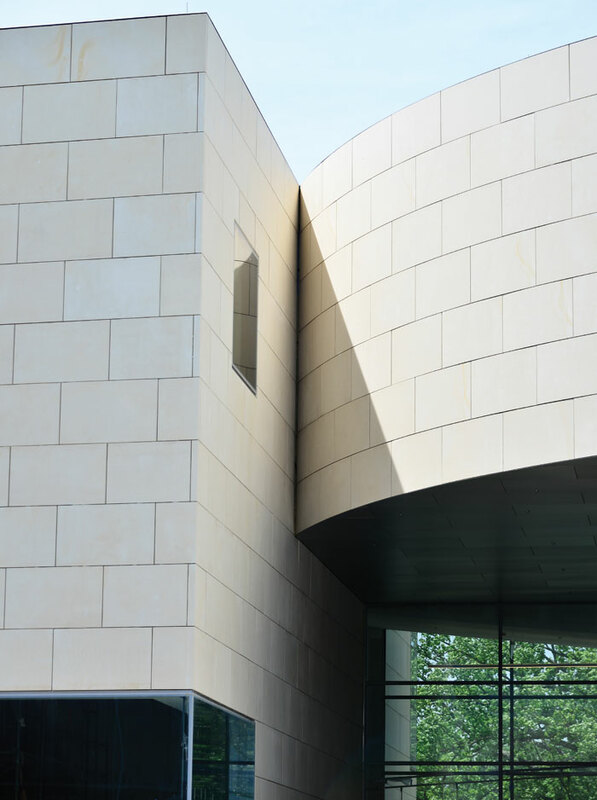 A rectangular block, it is devoted almost entirely to a 325 sq m rehearsal hall at the Forum and courtyard levels and nearly 30 smaller practice rooms upstairs. 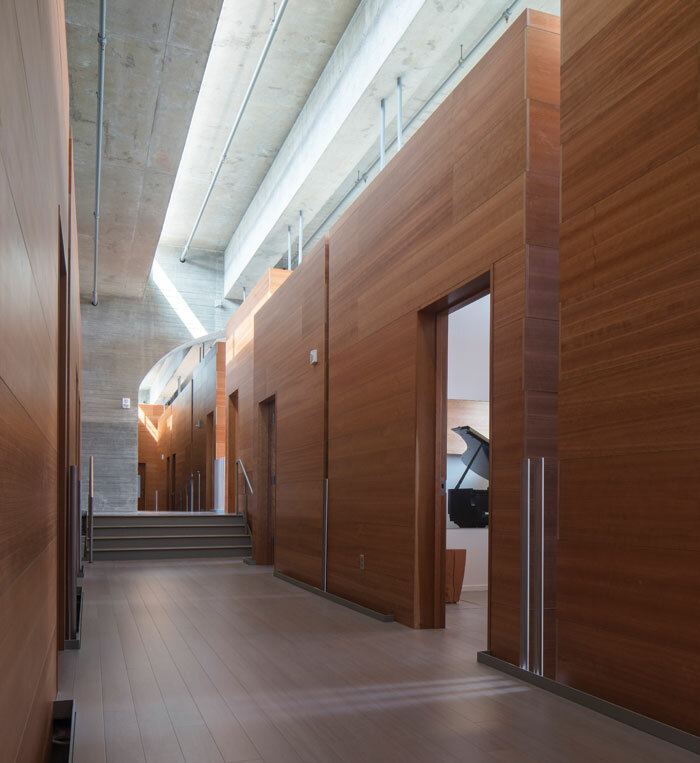 Those are boxes built of rosewood with staggered-exposed-edge corners, almost like tongue-and-groove-built furniture. Each box, separated by at least 25cm from those flanking it, is supported from above by steel rods, ensuring an extraordinary degree of acoustic separation. The rosewood boxes, which themselves have only small windows, are visible from the courtyard through a facade of unusually transparent glass (Interpane Ipasol Neutral 70/37), creating a stunning, and almost surreal sight, as if the contents of a small town had been lowered into a vitrine. It’s rare that a practical necessity generates form so compellingly. Holl seized the opportunity that necessity offered; his music building is a tour-de-force. To the west of the music building is the six-storey tower, which is covered largely in milky white glass (made by Holl’s frequent collaborator Okalux, in an acid-etched finish). At night the white glass makes it a beacon; by day it and the Lecce stone make the building seem a bit blank. And, like the tower Frank Lloyd Wright added to the SC Johnson complex in Racine, Wisconsin, in 1950 — to which it bears a passing resemblance — it is less successful inside, where tight spaces and limits on the number of clear-glass panels make it feel claustrophobic. Holl’s desire to achieve uniformity on the outside, with clear glass set into the translucent glass at regular intervals, or at least at studiedly irregular intervals, and to mimic the proportions of Blair Tower — a nearby collegiate gothic touchstone — diminishes the interiors. To the south, responding to the music building’s crystalline front with a nearly blank facade, is the theatre and dance building. 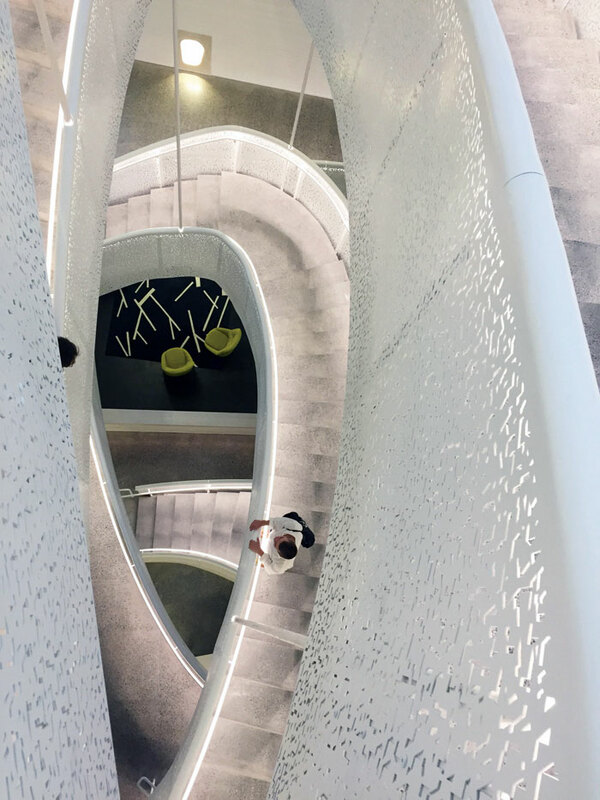 It contains the centre’s largest stairway, a seemingly lighter-than-air confection, supported from above, and nicknamed the Dancing Stair. The steel guardrail following its curving paths is perforated in a pattern inspired by Laban dance notation, and is appropriately gossamer. The stairway is at approximately the point where the building’s two forms, circular and angular, meet. But from inside it’s hard to get a sense of the overall organisation of the building, and it seems a shame that the circular form, so prominent from outside, is barely noticeable inside. But there’s a reason. The main spaces within the buildings — its raison d’etre — are black-box theatres, by definition rectilinear and opaque. There is also what might be called a white box: a huge, square dance studio sheathed on its two exterior sides in the milky Okalux glass. The room is magnificently luminous. Dancers, who have already nicknamed it the ‘cloud studio’, say they feel like they’re floating even before they take a step. It’s an effect that possibly no architect but Holl could have achieved. 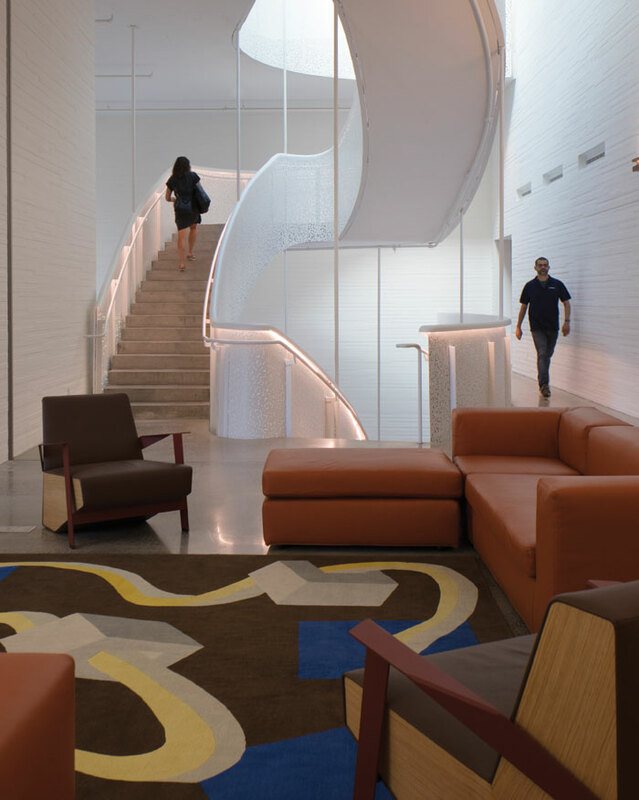 That ethereal room, the welcoming below-ground Forum, and the spectacular ‘village’ of the music practice rooms are enough to justify Princeton’s choice of architect.